With 18 years under his belt in the game industry, a key contributor to the MotorStorm series, and the creator of the 3ds Max in Minutes video series (at FocalPress.com), Andrew Gahan delivers the expert techniques in 3ds Max Modeling for Games, 2nd edition. This updated edition is packed with new tutorials that will enhance your modeling skills and pump up your portfolio with high-quality work in no time. Along with Anthony O'Donnell and a team of experts, Gahan covers all of the fundamental game modeling techniques, including character and environment modeling, mapping, and texturing. Finally, a bonus section in 3ds Max Modeling for Games offers readers insights and tips on how to get their careers started in the game industry. "An extremely comprehensive book covering all the basic theory and techniques with 3ds Max, currently used within the best game development studios in the industry"--Alex Perkins, art director, Sony Computer Entertainment Europe. 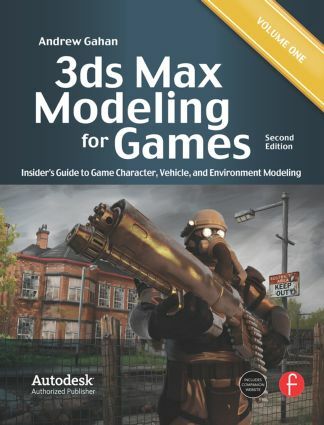 "For a beginner, getting to grip with 3ds Max is a daunting prospect, but this book picks on the relevant features and aims to get you producing usable 3D game art quickly and efficiently. It gives you a great understanding of what goes into make good 3D video-game art and will give you the vocabulary needed to talk with confidence about in-game models." --Don Whiteford, creative director THQ Digital UK Ltd.
Introduction to 3ds Max. Creating, Unwrapping, and Texturing Simple Models. Creating Complex Objects from Primitives. Vegetation and Alpha Maps. Low-Poly Vehicle. Creating LODs. Normal Maps. Gallery. Creating a 3D Environment. High-and Low-Poly Characters. Portfolio and Interview.